Image caption The Yahoo portal in China contains a farewell message citing adjustments to its operations strategy as the reason for the change. 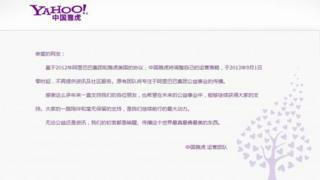 Yahoo's news and community services have shut down in China, following the closure of its email service last month. The Yahoo China home page now redirects users to a site run by Alibaba, which manages Yahoo's Chinese operation. In a farewell message which appears before the redirect, the firm says it is "adjusting its operations strategy". It also implies that its staff will be working on Alibaba content instead and thanks users for their support. Yahoo has yet to comment. The company faces big competition in the Chinese market. Social media services such as the Twitter-like platform offered by Weibo are hugely popular in China despite being openly censored. Yahoo has a significant stake in Alibaba, the business-to-business online retailer which has been licensed to run its Chinese services. Some analysts suggest that Alibaba's own services have benefited from its relationship with Yahoo. "China Yahoo has been under Alibaba for many years. Its most valuable properties have been dismembered and used," analyst Li Zhi from Analysys International told IT World. "Alibaba already has no need for a China Yahoo that's been squeezed dry."